AEAI’s work on a two-phase global study of slum electrification for USAID developed five detailed case studies based on missions to undertake direct discussions with proponents and stakeholders from four countries (India, Philippines, South Africa, Brazil) after conducting a desk study of 20+ case studies. The Team undertook a detailed analysis of the five selected cases, compared electrification approaches, and sifted out best practices for utilities dealing with technical losses, metering, wiring and safety issues, low-income tariff policies, subsidies, energy efficient appliances, gender distinctions, billing and collection practices, community-based organizations and other intermediaries for collection, upgrading and communications efforts, public information and other issues. The acquired knowledge from this study and lessons learned on best practices for reducing commercial losses and improving collections from low-income urban areas became the theme for a series of dissemination activities by USAID. These included: presentations to disseminate the information to other development agencies working on the issues at The World Bank Energy Week; a global workshop held in Brazil in September 2005 jointly hosted by World Bank, USAID, Cities Alliance, EDF and COELBA (Brazilian distribution/retail utility) on best practices and lessons learned for utilities, regulators and policy makers, and NGOs from more than 20 developing countries; and a U.N. Commission on Sustainable Development Learning Course in May 2006. 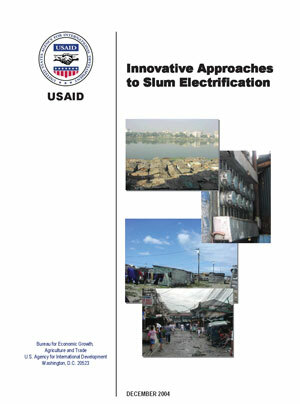 USAID launched the three-year Slum Electrification Program in October 2005 with the International Copper Association (ICA), to support regularizing electricity services in slum areas by developing, testing and evaluating customized approaches to improve electricity access and normalize services in slum areas, then take it to wide-scale implementation. USAID and ICA initiated two utility pilots with Eletropaulo in Sao Paulo, Brazil and BSES in Mumbai, India.